I feel like this is a real treat yourself recipe. Perhaps more of a special occasion meal, or a good reason to celebrate something random just for the hell of it. We made what seems like a million soups for the Free People blog last month, actually just 5 in reality... but I think we will be off soup for a minute yet. We were so excited after finishing up this shoot, but unfortunately it didn't make the cut. We had planned and executed the recipe before finding out that going forward we'd be sticking to vegetarian/vegan friendly recipes. Honestly, I didn't even care. Coming up with one more soup of the fly led to making the super delicious Butternut Squash Soup with Sage + Orzo, plus we got to have a special meal. This is great paired with a dry sparkling wine. 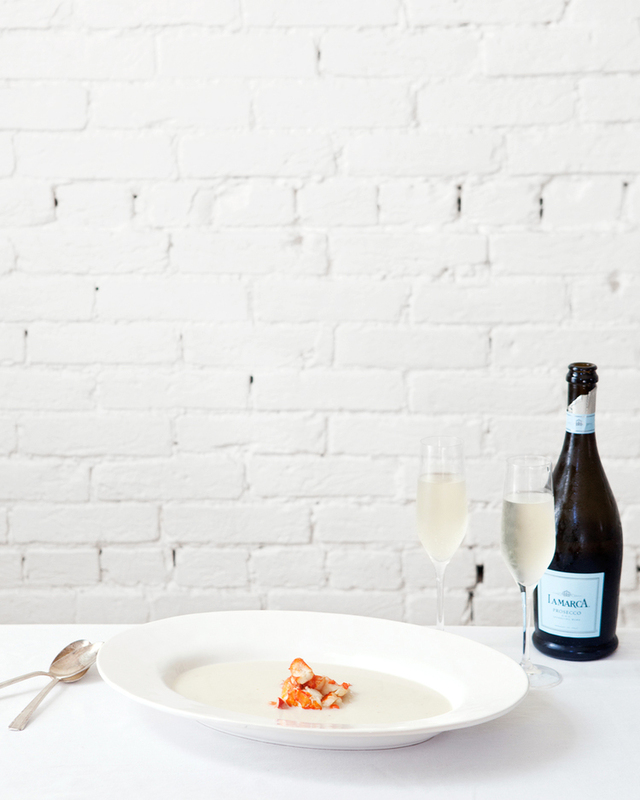 Prosecco is our longstanding fav in that department, and happened to be perfect for this. If lobster sounds familiar around these parts, you're probably remembering our recent Brown Butter Lobster Rolls that we made last month. 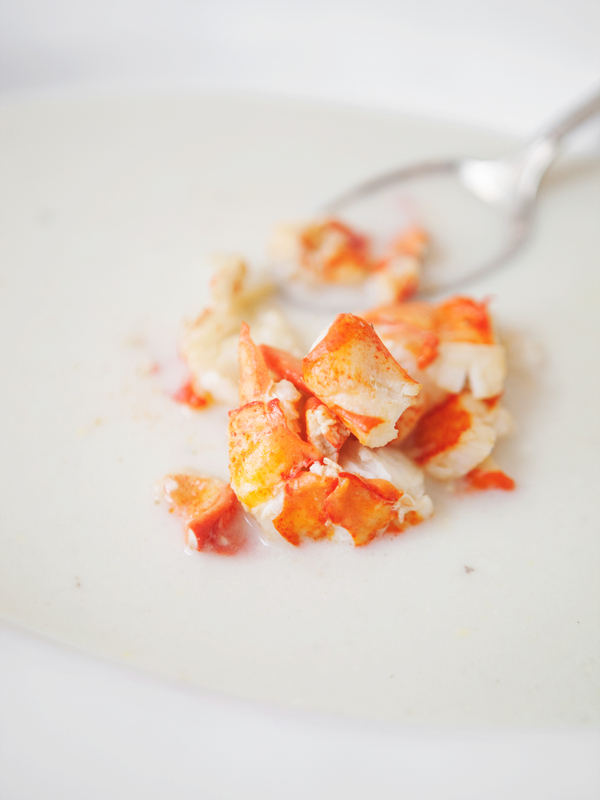 Robert prepared the lobster the same way for this soup, because you can never go wrong with butter and lobster. Cut kernels off the corncobs and set aside. Place leftover cobs in a large pot and cover with about 5 cups of water. Bring to a boil and cook for about 45 minutes. Strain the cobs and water through a fine mesh sieve, reserving the corn stock and discarding the cobs. In a dutch oven, melt butter over medium heat. Add onions and cook about 5 minutes. Add corn kernels, garlic, and a generous amount of salt and pepper. Cook for 2-3 minutes. Pour in corn stock. Bring everything to a boil, and then reduce heat and simmer for 25 minutes. Remove from heat when finished. Using a stick blender or working in small batches in a conventional blender, puree the soup. Strain through a fine mesh sieve and return strained soup to dutch oven. Heat over low heat and whisk in 1/2 cup of fat-free half and half. In a skillet over medium heat, melt butter and swirl to coat pan. Continue to cook butter, stirring frequently until it begins to foam, eventually turning a light shade of brown. Once butter has browned, add lobster meat to skillet, remove from heat and toss lobster to warm in browned butter. To serve, make a mound of lobster in bowl and gently pour the corn soup around it. Serve with Prosecco or another dry sparkling wine of your choice.